Ready in Just 2-3 Days! Want nutritious and delicious sprouts year-round? This mix of lentils and garbanzo beans is one of our fastest maturing sprout mixes and ready for harvest in just 2-3 days. 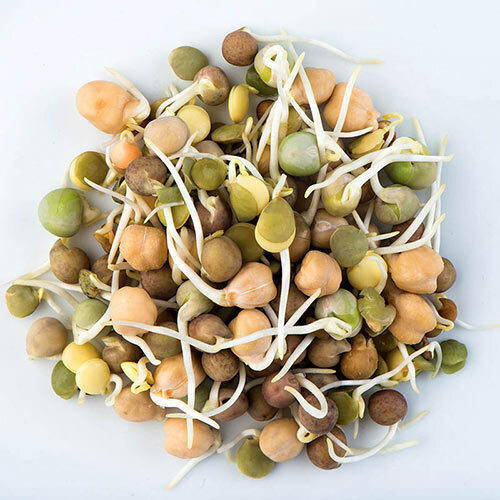 Organic Crunchy Bean Mix Sprouts add flavor, nutrition and crunch to salads, stir-fries and sandwiches, and they're so easy to grow in our Seed Starter Kit. We recommend harvesting sprouts when they are just a few centimeters long. That's when they're ready to eat and the most tender. 4 oz. CommentsAdd to salads and stir fries.